Birthday Cake Back Bling in Fortnite BR. 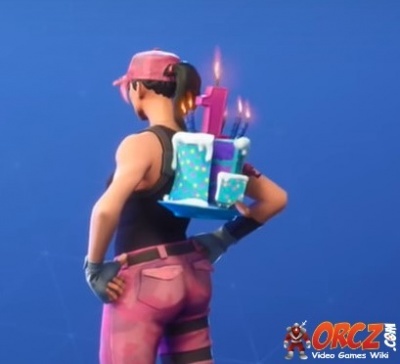 "Birthday Cake" is a Back Bling you can unlock by completing all three Fortnite Birthday Challenges in Fortnite Battle Royale. A Back Bling to celebrate Fortnite's 1st year anniversary. Shaped like a Birthday Cake. Complete all 3 Fortnite Birthday Challenges. The Birthday Challenges are available only from July 24th, 2018 to August 7th, 2018. This page was last modified on 25 July 2018, at 10:55. Content is available under Creative Commons Attribution Non-Commercial Share Alike unless otherwise noted.